I don’t think I have ever talked about conferences for writers on the blog, let alone had someone on who coordinates one. But with me on the blog is the fabulous Pamela Livingston, who roomed with me during grad school. She’s here to talk about the Book Passage Children’s Writer’s Conference in Corte Madera, California. Pamela: 1. I was the Macy’s Easter Bunny. 2. I am the proud owner of both a VCFA MFA in Writing for Children & Young Adults degree plus a Picture Book Certificate which I may have illustrated before finally finding space on a wall. 3. My newest aka is “Mama Goose” of Goosebottom Books since purchasing this award-winning publishing house from its founder, Shirin Bridges. 4. I’ve been a circus star stage mom. 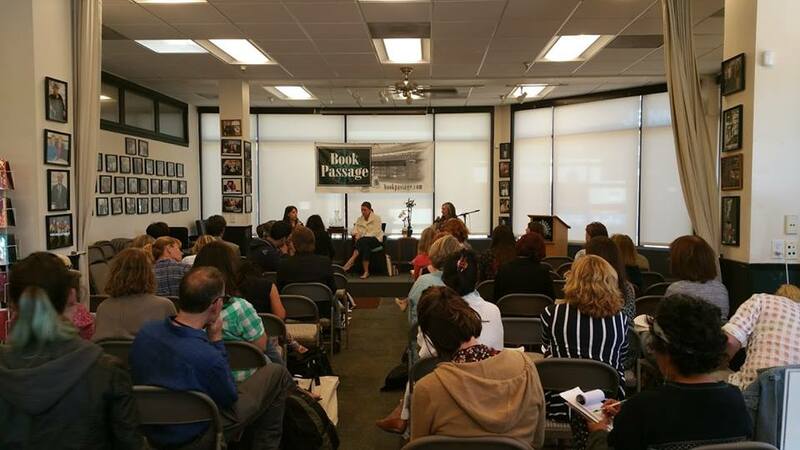 El Space: Tell us about Book Passage. What is it? What is your role in this conference? Pamela: Book Passage is one of the greatest indie bookstores in the world, having survived and thrived for forty-one years and counting under the eagle eye of Elaine Petrocelli, the voice of indies for NPR and other media outlets. I’ve been the conference director since 2016, although it feels more like a curatorial position, developing a potent experience for our participants. Over fifty percent of our attendees return year after year—this was the first writing conference I attended over ten years ago. Since I also head Book Passage’s Path to Publishing program, this conference provides me with an opportunity to mix in all of the components for children’s writers and illustrators. El Space: How long is the conference? How many years has the conference been held? Pamela: This conference is a three-day, Friday morning through Sunday afternoon, festival which includes meals with our faculty under a northern California sky. For almost twenty years we’ve held it at our Corte Madera store, just north of the Golden Gate Bridge. It was the first children’s writers and illustrators conference in the San Francisco Bay Area. El Space: What challenges do you face setting up a conference like this? 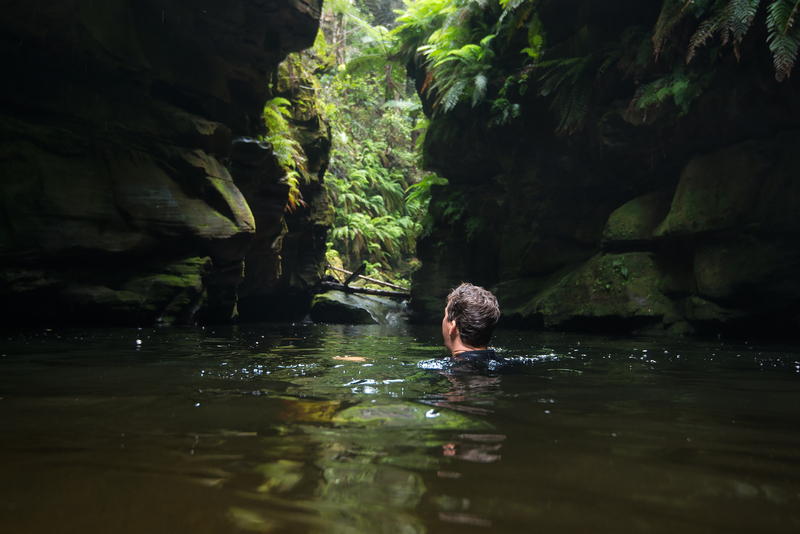 What do you find most enjoyable? Pamela: Embracing all of our children’s literary community is my highest priority while providing educational excellence. To that end, our faculty represents members of SCBWI, VCFA’s Writing for Children and Young Adults program, award winners from a wide range of genres, diversity in all sectors, experts in the business of books, plus dedicated editors and agents who can move our participants’ work to the next level. I thoroughly enjoy every aspect of this process, from coordinating with the authors, editors, and agents whom I’ve long admired, to hanging out with the conference’s attendees. It’s as if a wand was waived by the Fairy Queen of Books to create a dream weekend for my favorite people in the world. When I take into account faculty such as Elizabeth Partridge, Ellen Klages, Gennifer Choldenko, Tim McCanna, and Ying Compestine; plus Creston Books’ legendary founder Marissa Moss; Jennifer de Chiara’s venerable agent Stephen Fraser and representatives from West Coast agencies; editors from Bloomsbury and Cameron Kids—all in one place—I know I’m in for three days nestled in the Land of Enchantment. El Space: I’m especially stoked that Betsy Patridge (photo at the right) will be there, since she was one of my lovely advisors. Why is a conference like this important for a writer? What makes this conference unique? Pamela: Conferences are the best way for a new writer to learn if this is a world they want to be in, what it will take, plus pick up the tools and network they need to get them there. As this conference is held at the most lauded independent bookstore in America, we are able to pull back the curtain on the business of books. My journey began as a storyteller, but I knew nothing about the mechanisms behind the business of bringing those stories from the page to the patron. Even my two graduate degrees in writing were light on the business end of this process. It wasn’t until I managed a bookstore and bought a micro-publishing house that I developed a clear picture of this process. This conference not only focuses on the craft of writing, it provides the creators of children’s stories with an understanding of the business of books. El Space: What can a writer expect at a conference like this? 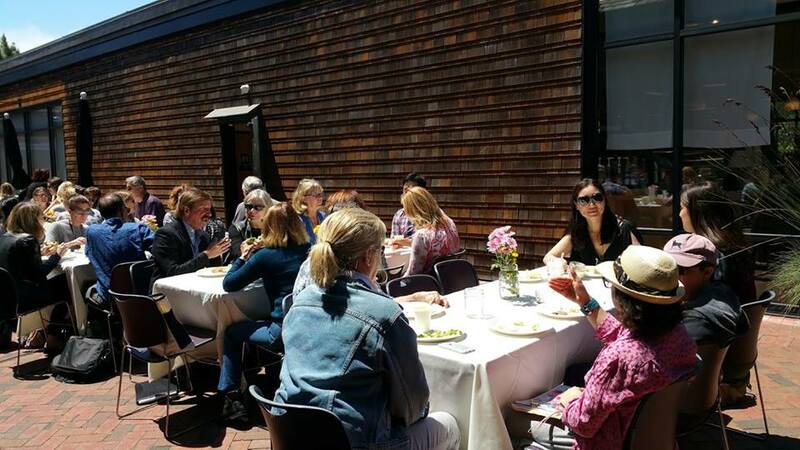 Pamela: Our conference is both intimate and active, with options for participants to choose their educational opportunities along with a comfortable bookstore setting and café to meet, chat and get to know the faculty and each other. At last year’s conference, I was as impressed with the participants as I was with the faculty, since our attendees included a multi-Grammy award winner, adult genre-published authors changing to the children’s market, author networking leaders, teachers, librarians, etc. And did I mention the food? Let’s just say that one of the best restaurants in the county caters dinner! El Space: Who should people contact for more information? Pamela: For more information, folks will want to check-out our website where updates are posted, along with our Book Passage Conferences Facebook page. El Space: What are you working on? Pamela: Besides the conference, finding the perfect illustrator for a Goosebottom Book on Marco Polo, learning Quark, and praying that a particularly wonderful editor flips over one of my circus picture books. El Space: Thanks for being my guest, Pamela! Photos of the conference crowd scenes by Ying Chang Compestine. 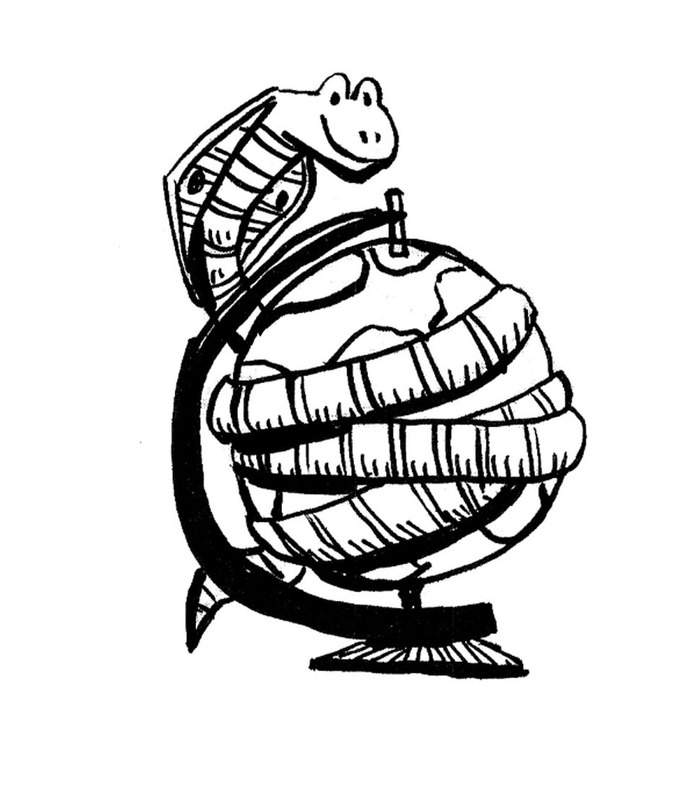 Conference logo designed by Mary Osborn. 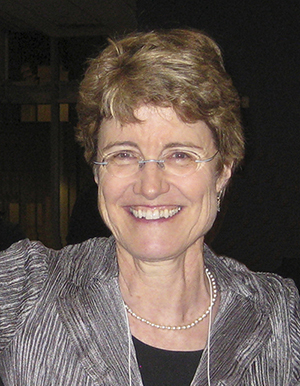 Pamela Livingston photo by Valerie Kippen. 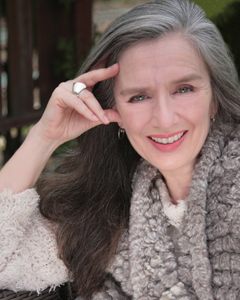 Elizabeth Partridge photo from her website. Check This Out: The Danger Gang and the Pirates of Borneo! Ahoy there, mateys! Glad I am ye stopped by today. 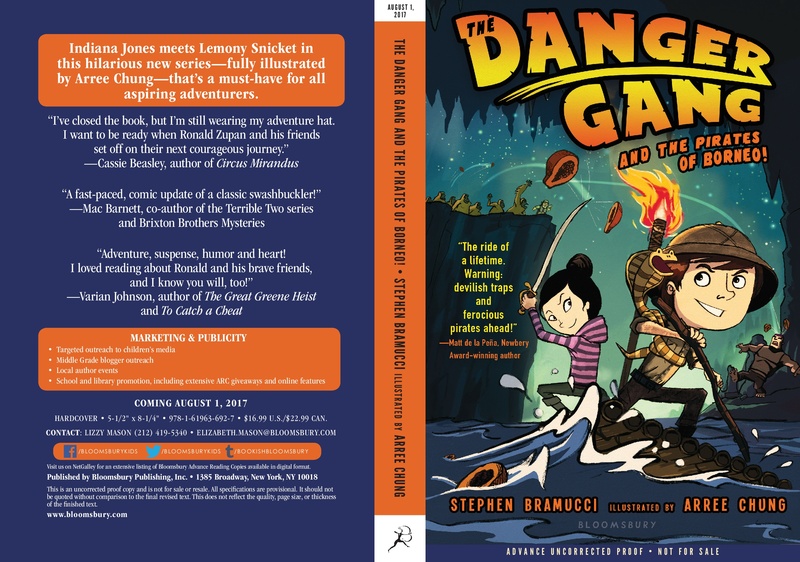 With me on the blog is the awesome Steve Bramucci, who is here to talk about his middle grade adventure novel, The Danger Gang and the Pirates of Borneo! ’Twas illustrated by Arree Chung, and then published by Bloomsbury on August 1. For a synopsis, go here. Steve is represented by Sara Crowe. In a few minutes, I’ll tell ye all about a giveaway for The Danger Gang and the Pirates of Borneo! But first, let’s have a chat with Steve! Steve: Random facts? Book related facts? Important life facts? Orangutan facts? I’ll try one of each! 1. 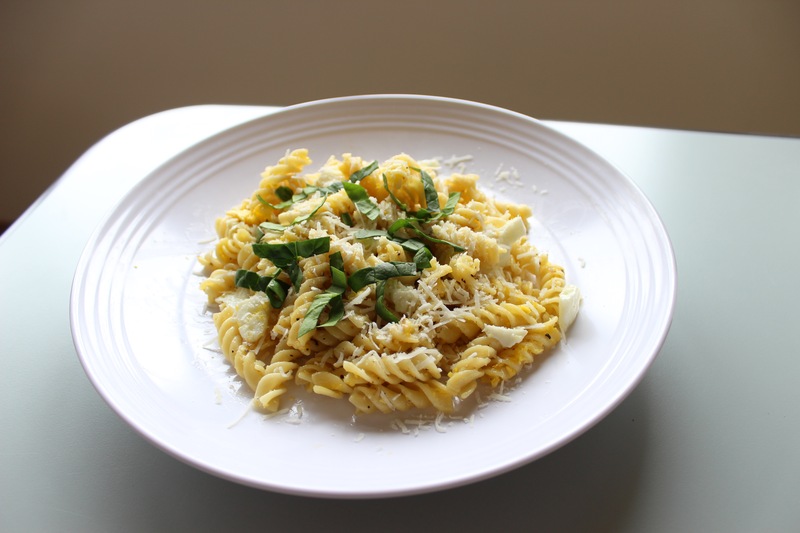 Even though I write about exotic food, my all-time favorite meal is just rotini overloaded with parmesan cheese. It was my favorite as a boy and the draw of “flavor nostalgia” still gets me at least once per week. I was traveling around the world a few years ago and missed pasta with parmesan so badly that I had a friend bring me some Kraft parmesan when we met up in Cambodia. 2. The first page of The Danger Gang and the Pirates of Borneo!—in which the narrator introduces himself—remains virtually unchanged from its very first incarnation, written during a break at an SCBWI conference. Everything else has changed drastically from those early days. 3. My dad died two weeks after the book sold. El Space: So sorry. You have my condolences. Steve: He was such an amazing guy that I’ve always worried I won’t be able to measure up to his legacy. That, really, is the theme of the book: One boy’s longing to impress his parents and step out of their giant shadows. 4. Orangutans are a truly astounding species and critically endangered due to habitat encroachment. A portion of my proceeds from the book go here. Anyone who decides they want to donate to that charity, or any other orangutan initiative, can email me on my website for some free Danger Gang swag! El Space: Awesome! You wear a lot of hats, including managing editor at Uproxx, and you’ve written travel articles for many publications. How did you come to write children’s books? 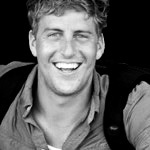 Steve: I’m actually surprised that more travel writers don’t start writing for kids. Travel is basically the real life incarnation of our childhood fantasies about adulthood—the way that we thought adulthood would feel when we were young. For me, travel writing is the chance to live out my boyhood adventure dreams, and writing this book was right in line with that. The journey to writing for kids was actually a little longer than me just pivoting all at once. I’ve been telling pirate stories to kids at schools and events near my home for more than a decade now, I’ve been involved in SCBWI, and even written another, unsold, novel. It wasn’t until I went to the Vermont College of Fine Arts that all the pieces congealed. El Space: The Danger Gang and the Pirates of Borneo reminds me of the fun of adventure stories like the Indiana Jones movies—at least the earlier ones—and The Goonies. What was the inspiration behind it? How did your main character, Ronald Zupan, come to be? Why was a pet cobra an ideal pet for him? 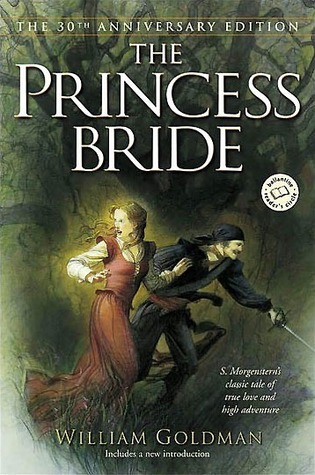 Steve: I definitely wanted the book to feel pulp-y, like an old-timey serial. The Indiana Jones connection was obviously intentional and you can see that in the way the book is packaged. Semi-side note: For me, modern technology rarely serves adventure, so Ronald and his friends sort of exist in a vague pre-tech era (50s? 40s?). You won’t see cell phones or computers or… I actually made great efforts to avoid mentioning any plastic objects all together. The Goonies is a huge reference point too. 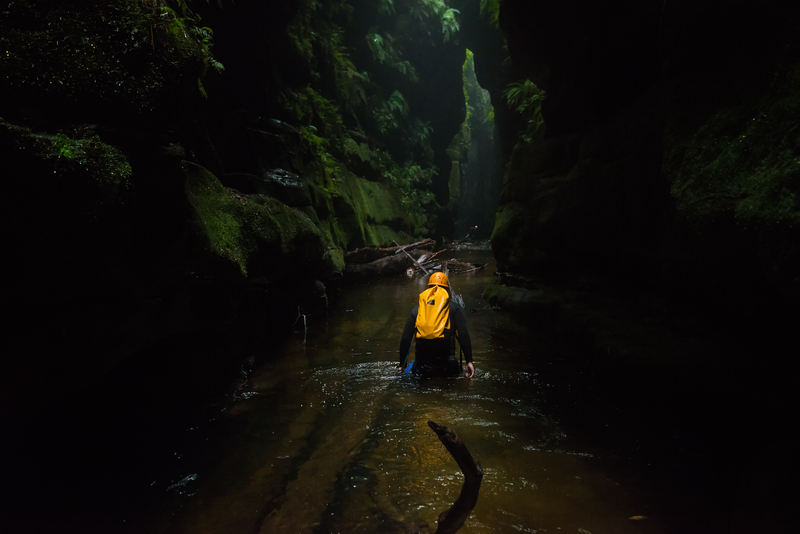 I love stories where the basic pitch is: “Kids go on an adventure and learn stuff along the way. Also, there are mean bad guys with bad oral hygiene.” Bloomsbury calls the book Indiana Jones meets Lemony Snicket which is the most flattering “blank meets blank” analogy I could ever hope to receive. • I’m highly allergic to cats and house dogs, so I always had reptiles as pets. My dad would take me to a farm and let me keep whatever snakes I could catch. • Indiana Jones hates snakes and I love them, so I wanted to give that massive series a little poke in the ribs by having Ronald be a snake lover. • Ronald would never have an ordinary pet, so the choice feels very natural for the character. • But mostly, it just came to me and people laughed. When I read something and people laugh, I suddenly become very attached to that bit. El Space: Are you a pantser or a plotter? What’s your writing process? Steve: I’d say I’m … a little of both. I’ll outline, but if some idea strikes me, I’m quick to ditch my notes. I’ll follow whims without much convincing. I also don’t outline before the first major turning point. I like to keep the early pages moving and full of that electric energy. In this series, Ronald and I are so similar in mindset that most of the time I just have to ask: “What would I do next in this situation?” By following that thought process, I manage to get Ronald in a lot of trouble. El Space: You’ve traveled extensively. Of the places you’ve visited, which is/are your favorite place/places to return to again and again? Why? Steve: I get asked the “favorite place” question a lot and my answer hasn’t changed in a long time now: Madagascar is my #1 place on earth. It’s just … for the adventure traveler, it’s really perfect: Affordable, exciting, not over-touristed, and unique, with incredibly kind people and a fascinating local culture. Also, the whole mini-continent has a rich pirate history and, as you know, I love pirates. As for a place to return to, I’m going to say the American Southwest. It’s just so iconic, so different from citified-America, so full of sprawling landscapes and potential for adventure. 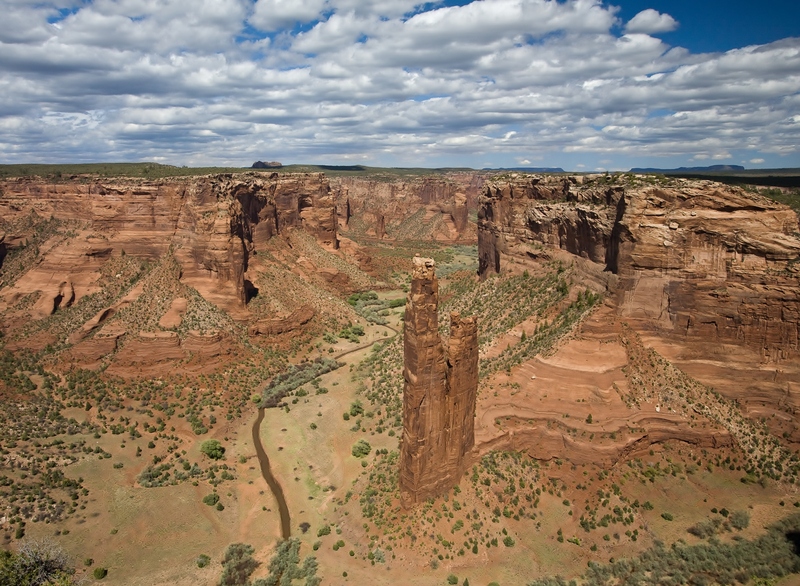 Every few years I go to Canyon de Chelly and ride Navajo ponies through the canyon for a few days. That’s one of my favorite shorter trips on earth. El Space: You’re going around the world, but can only take three things besides a passport. What would you take and why? Steve: Objects? A surfboard, an iPod without internet capability, and a good book—maybe a compendium of Twain or a copy of The Princess Bride. With that set up, I could travel for a year without much complaint. Steve: I’m finishing the edits on The Danger Gang and the Isle of Feral Beasts right now! Thanks, Steve, for being my guest! Where in the internet world is Steve Bramucci? You can find him on Twitter, Facebook, Instagram, and Uproxx. The Danger Gang and the Pirates of Borneo can be found at Amazon, Barnes and Noble, and Powell’s. But one of you will find a copy of it at your doorstep—or tablet if you prefer—simply by commenting. Winner will be announced on August 14. Photos and book cover courtesy of Steve Bramucci, with the exception of the Canyon de Chelly photo, which is found at galleryhip.com, the rotini photo, which is from 34st.com., and The Princess Bride book cover, which is from Goodreads. 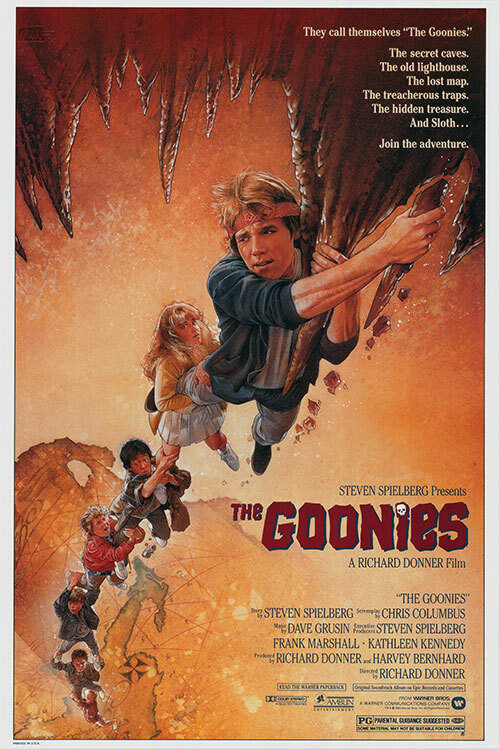 The Goonies movie poster from movieposter.com. 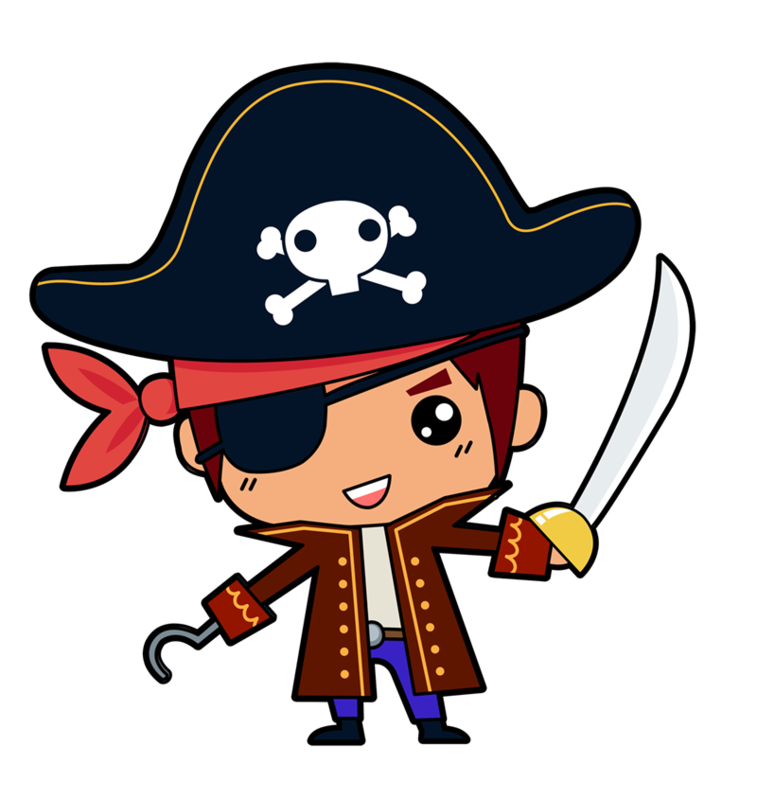 Pirate from clipartlord.com.